Hankering for some homecooked food, in the form of a large family feast? If so, Gu Ma Jia at Tai Thong Crescent is probably one of the best places to go for clean, nutritious and rich food that taste authentic and homely. I was lucky to be invited for their 5th anniversary new menu tasting (after hearing about it a few times before from other bloggers). It's been 5 years? Wow! I found out that "Gu Ma" hails from Pulau Ubin, so whatever dishes we are having can be considered "island cuisine"? We first started with the Gu Ma Signature Traditional Bean Curd Soup ($28). It is boiled for 6 hours using salted fish head, chinese ham, pork ribs, peanuts and fresh beancurd. I was not used to the salted fish head taste in a beancurd soup initially, but you could taste every bit of the goodness coming from the ingredients and into a soup. Next we had some Homemade Yam Ring with Kyoto Pork Ribs ($30) which was decent. The yam ring wasn't too oily and the pork ribs wasn't dry or tough, which is good. I didn't think there was anything 'Kyoto' about the pork though. The XO Prawn Noodles ($36) are worth ordering. The soup was really intense and packed to the brim with the sweetness of prawn, and the XO taste wasn't perceptible on its own (but probably the reason why its so flavourful). I reckon you could share this among 4 people, making it $9 per pax. Next, something a bit more innovative - the Claypot Pork in Sesame Oil ($15/$23/$30) which is one of my favorites that night. Even though it says sesame oil, it is not oily at all, while the pork was fresh and tender. There's also the Satay Cuttlefish ($18) which to me is quite normal, even if the cuttlefish is not hard or rubbery. Perhaps it's because I'm not a big fan of cuttlefish. Next was the Ubin Lala Bee Hoon ($18), for those who like their noodles to be seafood-infused. I am not really into shellfish (especially the cockles, lalas, gong gongs), but what I tasted was not fishy at all but quite light and fragrant with the taste of the sea. Lastly, a seafood that I eat on a normal basis - fish! This is a mainstay from the previous menu (probably because it is so good)! The Assam Fish Head ($28) was super fresh, full of meat and the sharp tang of Assam with a slight spicy edge kept the fish head interesting. For those with Assam Fish Head cravings, this will be the perfect place! Lastly, some greens to complete the meal. It's something I've never had before, which is the Yuan Yang Kai Lan ($12)! It is done in 2 styles - as you can see, the greens have been flash fried (I think?) after it's been boiled.. so they ended up having this crunchy seaweed-like texture. Lastly, a cup of refreshing Vinegar Enzyme Jelly ($5.80) to end the meal! Another innovation from Gu Ma - this dessert was "house" made using fruit enzymes - great for your digestive system and health! There's simply nothing to fault at Gu Ma Jia! Prices are reasonable, and the place is not pretentious. It's really like eating at home, so I'll suggest for you to bring your folks or even to go with some like-minded buddies for a meal full of warm, comfort food. 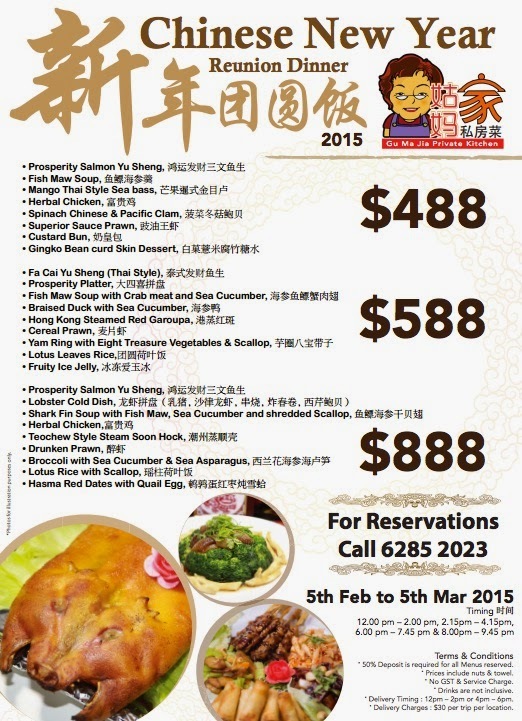 By the way, check out their CNY menu!